The Baader Hyperion Digital T-adapter # HTA43/T-2 2958080 permits direct coupling of any T-threaded camera or accessory to Baader's Hyperion eyepieces. The Hyperion fixed focal length eyepieces or the new Mark-III 8-24mm zoom eyepiece feature a male M43 thread under the rubber eyeguard. This adapter converts this 43mm thread at the eyelens of the Hyperions to a male T/ T2 thread (M42x0.75). This enables the Hyperions to be used with CCD and DSLR cameras for classic eyepiece projection photography. With this adapter, any T-2 extension tubes (sold separately) can also be used in-between the eyepiece and camera to project and magnify the image as much as desired. The threaded direct-coupling makes this system extremely rigid and compact. Please note that this adapter cannot be used with the older Baader MkII Zoom Eyepiece (only the new MKIII version). Note: Baader refers to this product as HTA43/T-2, SP43/T-2 or M43/T-2. They are all one and the same. 4.9 (Based on 22 Reviews) 95% of reviewers recommended this product. This adapter allows me to connect my Baader Hyperion Zoom Mark IV and Baader Hyperion 13mm to my Canon camera, using a T adapter. It holds the camera well and it feels the camera is securely attached to my telescope. It was all I was expecting. I would recommend to anyone wanting to do projection astro photography. I have not had a chance to use this device yet, but it does fit well with my eyepieces. Just what I needed to hook camera up on my Orion Star blast 62mm.Works great. Afocal projection for my revolution imager was easy with the purchase of this adapter, the /T-2 Budget Eyepiece Holder, and the Baader T2 Extension Tube - 7.5mm . Just screwed them on top of my Hyperion 17mm and popped in the video camera. Worked great for showing moon images at a star party. Review by Keegan of Calgary, AB. Bought this for my Hyperion Zoom, and Hyperion 5mm eyepiece. Great addition for anyone looking to take up astrophotography!! Review by Nicolas of Belgium (Europe). The OEM option to adapt a T2 camera setup on a Baader Hyperion eyepiece. Using it on the 8-24 zoom, this is really versatile. Remember to buy a 30mm or 40mm T2 extension ring or sensor illumiation will be quite bad with a DSLR. Review by fox of Italy. This is my second purchase on agenaastro, they are very professional and sell high quality stuff to the lower price. This adapter allow reflex to adapt to the Hyperion Zoom (that I bought from them 2 years ago). Shipping was very quickly and the product is very good, very simple to use and really make me enjoy my nights as observer! Review by Jeff of Fort Collins, CO.
Not much to say except that it fits like it's supposed to. Review by Homac of Canada. Rather than trying to find something else that may work, ordered this adapter and it worked perfectly. Also shipped and received right away. Review by cdgarcia of Granada Hills, CA. Quality construction. Easy to attach. Review by sjv0mmv of West Palm Beach, FL. Review by Steve of Maryland. This adapter works perfectly. It enables me to mount my DSLR with appropriate T-adapter to my Baader Hyperion zoom eyepiece to take astronomy pictures. Review by Jeff of Kenosha, WI. This was just the item I needed to connect my Baader Planetarium 8-24mm Hyperion Clickstop Zoom to my DSLR. Review by Star Gazer of Bandera, Texas. 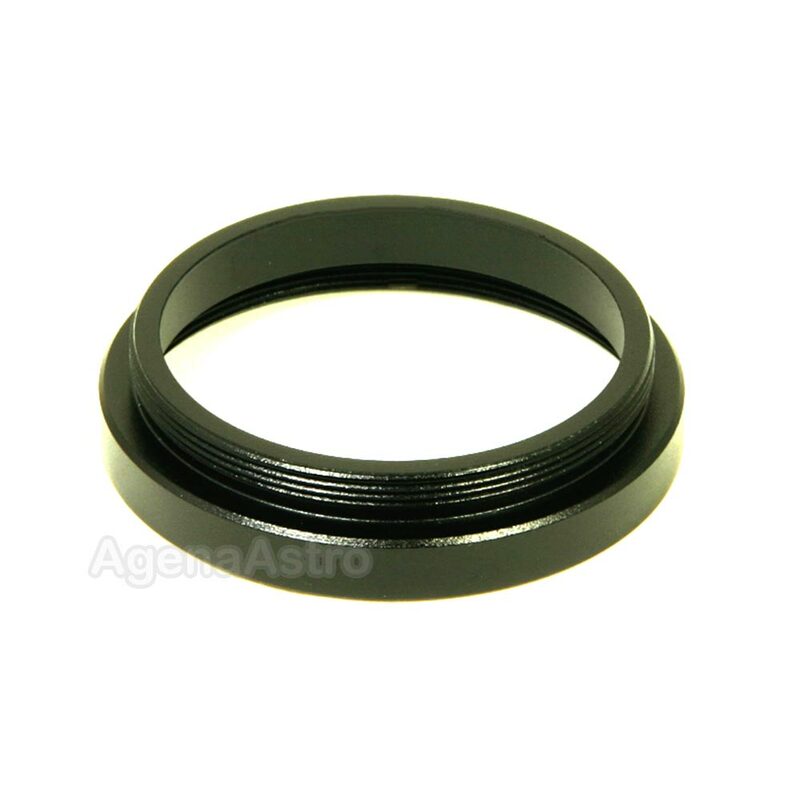 You will need this to adapt your Baader eyepiece for projecting magnified images onto your CCD for astronomical photography. It screws on the eye lens end and adapts to T-2 threads for attaching extension tubes between the eyepiece and your CCD camera. This method provides a mechanically stiff connection between the telescope and the camera, reducing flexure and image blurring. The price is reasonable, and the quality is very good. Review by Conrado of Sao Paulo, Brazil. I was looking for a better setup (camera and eyepice) for astrophotographs and the adapter allowed me to put together my two "jewels of crown": the Canon Rebel T3i and Hyperion 21 mm. This setup can be used for planetary as well as DSOs pictures.Just perfect. Review by Fernando Lopes of Brazil, PR, Curitiba. 5.0 Now I can get astrophotos. Review by Grampa Jim of Albuquerque. I use this to enable eyepiece projection photography with my Canon 40D on my Hyperion eyepieces. It has provided a convenient, stable connection. 5.0 Great piece of equipment! Great piece to have with your Baader Hyperions! Simple to install and allows afocal shots through your EP. Yet another reinforcement of the flexibility of the Hyperion eyepieces. Three simple steps and your camera is attached to your scope (via a Baader T-adapter and maybe a slected spacer of course). Solid little adapter ring.